Traveling with or transporting small animal species (cats, dogs, ferrets, rodents, birds, lizards, etc.) may require a Certificate of Veterinary Inspection (CVI) from a veterinarian, depending on state laws. CVIs, also known as health certificates, show that animals have been examined by a veterinarian and that they are healthy for travel and free of transmissible disease. 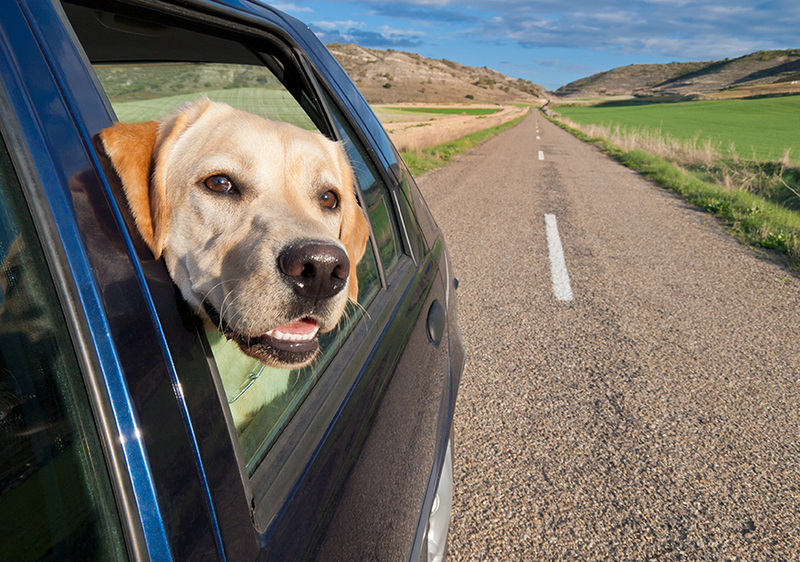 The APHIS 7001 form has been provided by the USDA to veterinarians since 1986 as a health certificate for interstate travel of small animals. However, these forms became available as a downloadable pdf in recent years, and many state animal health officials no longer accept these forms because of several critical changes. There’s a higher tendency to forge a vet’s signature and create fraudulent 7001 forms. Georgia is one of the 23 states that have already stopped accepting APHIS 7001 forms for health certificates. In addition to the states that have officially rejected 7001 forms, at least eight other state governing bodies have their regulations under review to consider rejecting them. 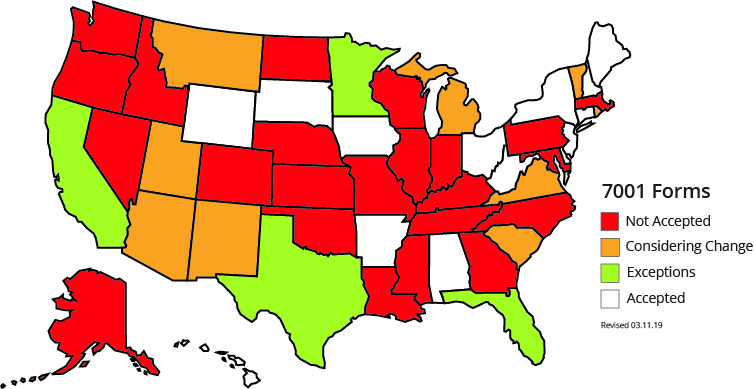 As of November 27, 20, these states no longer accept APHIS 7001 forms or have their regulations under review for 7001 forms. While animal disease traceability has been common in the livestock and food animal industry for years, small animal movement has had less regulatory oversight. However, the concern about potential disease transmission is still present in small animal movement. Even among the states that still technically accept 7001 forms, many state veterinarians discourage their use and encourage veterinarians to embrace more secure alternatives and utilize digital health certificates for interstate movement, exhibition or shipment. “There are multiple CVI options available to securely and legally move animals,” Dr. Cobb stated. Each state has their own documentation requirements for small animals entering the state, but most states do require a CVI for small animals. That may include owners traveling with pets, animal rescue organizations, and breeding companies that may move a large amount of animals at a time. A free resource for looking up interstate movement requirements is www.AnimalRegs.com. This public site, built by GVL®, incorporates information sourced from state animal health officials to provide current regulations and requirements for moving any animal species from state to state. GVL’s software platform for veterinarians also incorporates these movement requirements into the creation process of CVIs and auto-checks for errors. If your state hasn’t rejected 7001 forms yet, it’s a good idea to start preparing now for any changes that my come in the future. With GVL, veterinarians have a secure, universally accepted CVI system that offers all of the above features and benefits. GVL’s digital CVIs are accepted by all 50 U.S. states, and are an official option to replace 7001 forms for interstate travel of all animals. GVL also works directly with state animal health officials to ensure their platform is accurate and compliant. Plus, veterinarians can quickly and easily share digital certificates with clients, which they can access in the MyVetLINK app. With a fully staffed customer support team, GVL offers extra training, troubleshooting and assistance that is uncommon in competitive solutions. In our webinar, Handling the 7001 Crisis with eCVIs, we explain the continued challenge of APHIS 7001 forms and how digital health certificates can solve the issue. Watch the 7001 form webinar: https://www.globalvetlink.com/7001form/. SAVE THE DATE: we have a new webinar about small animal movement requirements with Dr. Valerie Ragan on Wednesday, March 13 at 12:00 p.m. Central Time. Overall, most state animal health officials see the end of 7001 forms as a positive trend in the industry with more secure and compliant options available for interstate movement. This is an opportunity to move toward safer and more secure CVIs, especially with digital formats. If you’d like to see how the GVL system can help you with CVIs, regulatory compliance and client communications, contact a GVL team member today: 515-817-5704, info@globalvetlink.com.